Fabulous Oceanfront Studio Condo - $395 a week JUNE JULY AUG & SEPT.
Just a few miles South of town next to the Park Royal Hotel. You do not need a car. We are right on the bus line. It is about 50 cents to ride to old town town about $6 for a taxi. June 1st through September in condo 501. (Condo #501 is $70 a night for shorter stays for the low and mid season). May 1st through December 14th in condo #509. December 16th through April 30th is $95 a night in both condos. WE NOW - have our own 25 Megabit high speed WIFI in both rooms. We also have new 50 " Ultra 4K Curved High Definition TV with tons of English channels and have a white corded VoIP phone that allows you to make crystal clear free calls to the USA and Canada (dial 001-#). (Do not use the house phone for these calls). The building will charge for calls made through the house phones. CUSTOM WOODWORKING, AND A KING SIZED BED. Condo #501 is next door to a hotel and you will be able to hear their air conditioner when on the balcony. Free Wi-Fi High speed internet access. A new HDTV TV & HD DVD Player with several newer movies, Cable Television with 18 English channels. We have a new Stereo with Bluetooth & a CD Player. The condo has been completely remodeled with all new custom tile and woodworking, It has Climate Controlled Air Conditioning, and a ceiling fan. We have a small safe in both condos (email for combo if interested. We have a New King size Bed and a new Sofa Hide-A-Bed. Large Swimming Pool. Local Bus Service. Affordable Taxi Service. Great Swimming Beaches. Lots of towels and linens. Maid Service Available for extra fee. Fully Equipped Kitchen with a toaster oven, stove top, microwave oven, frig/freezer, coffee maker, and blender and dishes. Wheel Chair Accessible. We belong to the laundry club so you will have access to the washer and dryer. Description: 509 - April 1st through December 16th - $490 a week in #509. Our oceanfront condo #509 is in the desirable (very quiet) center of the building. CUSTOM WOODWORKING, AND A KING SIZED BED. Free Wi-Fi High speed internet access. A new HDTV TV & HD DVD Player with several newer movies, Cable Television with lots of English channels. We have a Stereo with Bluetooth & a CD Player. The condo has been completely remodeled with all new custom tile and woodworking, It has Climate Controlled Air Conditioning, and a ceiling fan. We have a small safe for your use. Please email for combo if interested. We have a New King size Bed and a new Sofa Hide-A-Bed. Large Swimming Pool. Local Bus Service. Affordable Taxi Service. Great Swimming Beaches. Lots of towels and linens. Maid Service Available. Fully Equipped Kitchen with a toaster oven, stove top, microwave oven, frig/freezer, coffee maker, and blender and dishes. Wheel Chair Accessible. We belong to the laundry club so you will have access to the washer and dryer. Were right on the bus line. It’s about 40 cents to ride to old town, or about $6 for a taxi. New HD Television & VCR. Cable TV with 18 English Channels. DVD Player with dozens of newer movies. Lots of towels and linens. 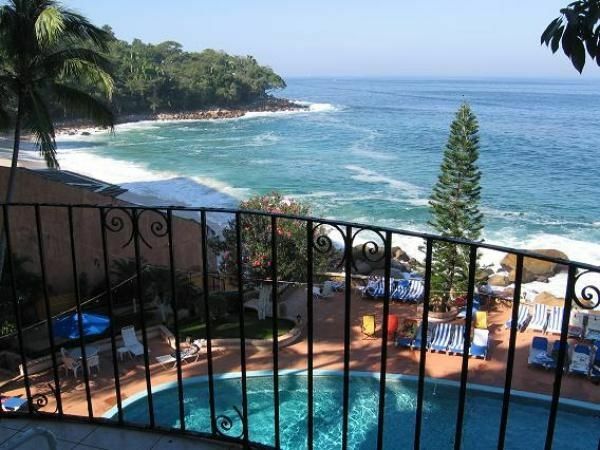 Ocean front condo on one of the best beaches in Puerto Vallarta. (Playa Gemelas). Enjoy Hiking, Fishing, Wildlife viewing, Whale watching, Horseback Riding, Golf, Shopping, Swimming, Snorkeling, Diving, Water Skiing, Boating / Parasailing and much more! High Season rates for both of our oceanfront condos. $95 a night, $2495/month December 15th through the end of March. Deposit are forfeited if you cancel your reservation. We also have an oceanfront condo listed with VRBO in Lincoln City, Oregon. Please email us for details if interested. At the Puerto Vallarta Zoo. We fell in love with PV on our first trip there. We have been all over Mexico, but Puerto Vallarta will always be our second home. Its like living at an affordable resort, where everything you need is right there. The owners are very friendly, and the staff is great! You might never want to leave the property. WE NOW - have our own 25 Megabit high speed WIFI in both rooms. We also have new 50" Ultra 4K Curved High Definition TV with tons of English channels and have a white corded VoIP phone that allows you to make crystal clear free calls to the USA and Canada. (Do not use the house for these calls). The building will charge for calls made through the house phones. WE NOW - have a corded phone in both rooms that allows you to make free calls to the USA and Canada. Whisper quiet climate control AC. We belong to the laundry club. HDTV with lots of English stations. Dozens of DVD movies in the room. The condo is located in a very quiet area, one of the best in PV. It sits in between two clean and quiet beaches. The property and the condo were both impeccably clean and well-maintained. Service at the property was excellent and everyone went out of their way to be hospitable. The condo has gorgeous views! I would not recommend this condo for more than a couple. We are a couple traveling w our young daughter and the condo was small and cramped for us (big furniture, small space). The serious drawback is that property is CASH ONLY, a major inconvenience and expense. We had to constantly take a taxi to find a cash machine. Overall, this is a very good overall place to stay. The condo had everything for a comfortable stay. Big fun in a little package! Our time in Matt and Deidre's condo #501 at Girasul Sur was extremely relaxing! My wife and I felt it was the perfect mix of all aspects of what you would want in a vacation setting for two. Beautiful scenery from the beach and the wonderful sunsets to proximity to old Puerto Vallarta via bus or taxi. The two beaches on either side of Girasul Sur are great! Many will say they are the best in Puerto Vallarta. The pool was large and kept at a nice temperature to relax in. The restaurant is right between the pool and the ocean. Offering the tables litterally yards off the ocean. One night's dinner the waves were crashing so hard we could feel the spray while dining. The service and food were both top notch. The staff was friendly and made every meal enjoyable wether is was breakfast or a romantic dinner for two. Condo #501 is roughly 400 sq ft, but has everything a couple would need for a short stay to a month stay. The king bed was comfortable but soft and the pillows were perfect. The bathroom had plenty of room and there was plenty of closet space for all your clothes and more. The kitchenette was small, but very user friendly. Everything was there that would be needed to cook any meal with a two burner stove, micro, toaster oven. There was air conditioning although we never used it because with the door open the ocean breezes were all you needed to keep the room plenty comfortable even in the heat of mid day. The balcony offered a nice table with chairs for you to enjoy coffee in the morning or take in the sunset with a glass of wine. Did I mention there is a wine cooler in the TV console. Speaking of TV they have a 50" smart TV with any channel you want and lots of DVD's as well. But who comes to PV to watch TV?? The condominium has a great staff that helps with anything needed including if you lock your condo keys in the condo! Also there is a great little market right on property that has everything needed to cook any meal and a nice beer and wine selection. They also have household needs, medical needs, and rent some household/kitchen appliances. Thank you for the great review and for staying in our oceanfront condo 501. We try our best to make our guests feel at home at our little home in the tropics. Beautiful views, absolutely perfect sandy beach access and a very hospitable restaurant on site! The condo is very quaint and comforatable! The bed and pillows were almost as amazing at the view!! There’s a private beach entrance that’s well worth spending your afternoons on. It is far off the beaten path and about a 20 minute drive to downtown. The one thing I would critique, and I wish I would have known about, was how incredibly loud the building is next to the condo. It definitely takes away from the view and tranquility of the balcony. Other than that, amazing! Freindly, well appointed facility with beautiful beaches. Unit 501 was well appointed and the owners were very responsive and helpful if we did encounter any problems. There are two beaches you can access, with beautiful clean sand and clear ocean water, great for swimming and snorkelling. The restaurant overlooks the ocean, the staff are very friendly but the food quality was not consistent. There is a well stocked store in the complex with friendly staff. Unfortunately the hotel next door has just completed a HVAC upgrade and the new system was running two days before we left. The fan noise was uncomfortably high. The apartment was a little too small, (No Room to put our luggage) for us but the view made up for it. The sink in the kitchen gurgles loudy in the morning and whenever the neighboring unit uses their water. I chattered my ankle jet skiing 10 days into our 28 day stay. I was in the hospital for about 5 days so when we arrived at Girasol sur we were extremely happy to know that it was wheel chair accessible and there was 2 elevators. Getting down to the restaurant at night using the wheelchair ramp was a little scary on my knee walker. No lighting at all on the ramp. We thoroughly enjoyed the beautiful large curved TV that was in the condo unit. The staff was very accomadating and the store was very convenient. We wished there was a menu from the restaurant in our room to order food for pick up. We stayed at 3 different locations in PV looking for our retirement dream home. We discovered after spending one week in your beautiful condo on the water that we have to buy a home on the water without a doubt! We had a quick (three day) visit but would love to go back. The unit is pretty small but cozy and the beaches are small but glorious. Snorkeled right in front of the condos, ate at the little restaurant overlooking the ocean, swam in the pool. All good. The colour of the water is stunning. Thanks Matt and Dede.